One of our best sellers! 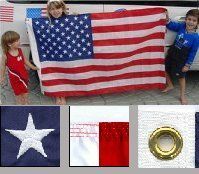 Our USA Embroidered 3x5 flag is a great investment for your house or boat! It's embroidered, not printed, making it very durable and of the highest quality. Great grommets keep it securely in place and prevent raveling. Start flying a flag today!